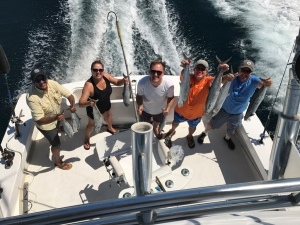 It is time for your FIRST deep sea fishing trip. You are on vacation in Fort Lauderdale, Hollywood or Miami with your family and one of the things you have decided to do is go fishing on the deep blue sea. You are excited for yourself and your family. There are both pros and cons to having novices on board. One pro is you have no bad habits to break. A few TV shows might have influenced you but that’s not too bad. One con is you have much to learn and it usually involves a fish on the end of the line. A great way to start! Now our family today was from the Chicago-land area. Brian and his family were aboard for their first deep sea fishing trip. They brought ample food and drinks and were generous with what they had brought. And our first fish was a Kingfish that we lost on the way to the boat. Did I do something wrong??? It’s almost hard not to smile when we are asked this question. The truth is you can do everything right and still lose a fish. Or you can do it all wrong, and I mean wrong! And you still land one. It’s all part of the game. Now Brian and his family had a great trip. They didn’t know what to expect so they expected nothing. It’s hard to disappoint someone with that attitude. 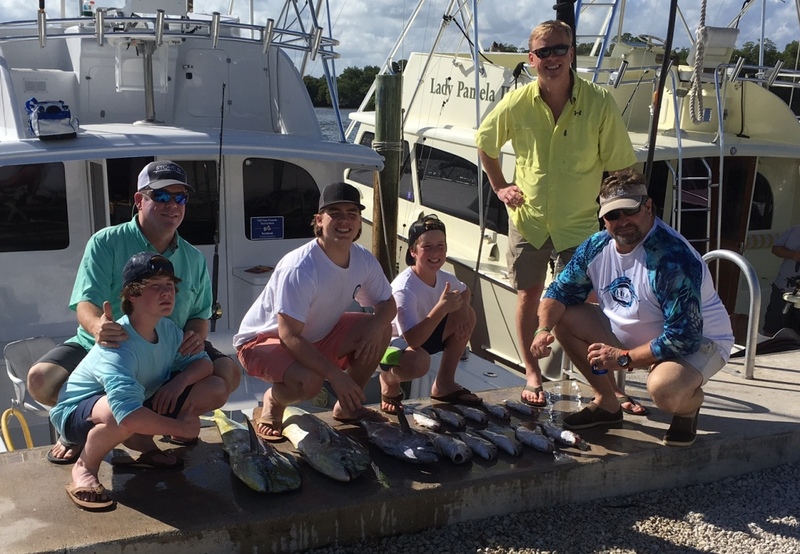 They caught some Kings, a few Snappers and a Sailfish, the real brass ring on this trip. We will now have a problem if and when Brian and his family return. You see, he thinks this will happen on every trip. How I wish it could but that isn’t always the case. But for the moment, may he enjoy his first deep sea fishing trip and his prize, which will be featured in the basement game room. Thank you Brian, you were wonderful guests. 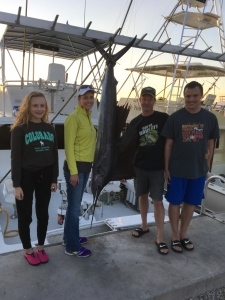 A daytime Swordfish trip is a bit different than the evening and nighttime trips. Other than the obvious ability to see during the day, nighttime trips allow for more rods to be in position to hook and catch Swordfish. During a daytime Swordfish trip, only one rod is used to fish in depths of over 1500’ of water on the bottom and it is electric. With a 10 lbs. weight at minimum and over 2000’ feet of line out, no one wants to retrieve it if the bite doesn’t come. But the really nice part about a daytime Swordfish trip is you aren’t just limited to catching Swordfish. As we travel the some 15 nautical miles from shore, we are always on the lookout for weed, birds and debris that can hold fish like Dolphin, Tuna, Wahoo and more. High speed lures can also attract Marlin, Sailfish and other species. Our group today was quite delighted with their daytime trip even though we didn’t land a Swordfish. As a matter of fact, we had to pry ourselves away from fishing for Dolphin so we could go try a drop. We found birds working everywhere from 8 to 12 miles from shore. Each time we would get under the birds, Small schoolie Dolphin would attack our baits. Our group was quite versed at this kind of fishing and stood ready with spinning rods and pitch baits. The group was divided on this but we finally agreed to start fishing the bottom. The first drop was a bust but the second drop got us a nice bite. Unfortunately, we pulled the hook with the fish about 700’ from the boat. We reset for a third drop after moving ahead of the fish and again had a bite. Actually, more than one bite, the fish was following the bait, whacking it with his bill until he fouled the bait, the end impaled itself on the hook and began spinning. Our prey lost interest. On our way home we found more birds and caught a few more fish. They weren’t all keepers but we ended up with 18 nice ones. We were a little late returning and it was almost hard to stop catching fish. A daytime Swordfish trip is about catching Swordfish. But the consolation prize can be nice too. With the holiday weekend upon us, many people are saying “Let’s go fishing”. I know this to be true because my phone has been ringing quite a bit, even yesterday with all the on and off rain. So what might you expect if you do go fishing this weekend? Well, expect to see lots of boats on the water. The forecast is for light winds and fairly calm seas. This is based on what the weather service is predicting. They have never been wrong… None the less, other than the occasional shower, I expect weather to be great. As far as our fishing goes? The reef area has been teaming with Kingfish and Bonitos. If you go drift fishing, you are going to have to move that bait to attract the fish’s attention. Depending on the current and how hard it moves will determine if the bottom fishing is possible. Even on days with some good current, you can still get down to the bottom and catch Mutton, Yellowtail or Vermillion snappers. Our charter boats have been having the best luck with trolling lately. Kings and Bonitos provide much of the action but the occasional Dolphin has also been found. Most have been small, too small to keep. Blackfin Tuna have also been around with a few good sized ones even though it’s getting a little late in the season. Sailfish on the troll and with live bait have been present as have a few sharks. But with this warm weather, They are moving to deeper waters. You just never know. What you do know is it is going to be beautiful this weekend. So if you’re looking for something other than burgers and dog to throw on the grill? Let’s go fishing! One of the greatest rewards in this business is fishing with kids. 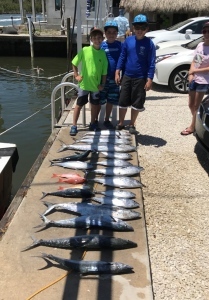 Taking folks fishing everyday does have its rewards, but fishing with kids has a sort of rejuvenating power of excitement, as did our trip yesterday with 3 youngsters that are pictured with their catch. We begin this day at 5:30 am. I’m barely starting on my second cup of coffee and a car is sitting at our dock. Captain Adam and I are preparing the boat for a very early start when a second car appears with the host. This prompts a release of the first car’s occupants. Let the games begin! We get our guests on board and the 3 boys are like ants moving around the cockpit. The questions begin and by the time we untied the boat to catch the bridge? I was exhausted from the barrage of questions. Captain Adam was now in charge as the fishing gear came out and the talk never ceased. No, the ONLY way to quiet these boys was with a fish! 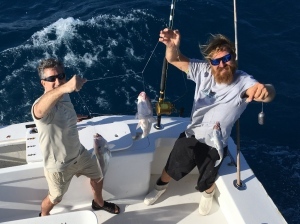 And after missing our first few bites, we finally connected A Kingfish was coming in and you’d have thought we had a world record on! Watch out for the teeth, they are sharp, as the boys crowded around Adam to inspect their first catch of the day. And so it went, with the boys learning to recognize what a bite looks like, how to attack quickly at the rod handle to set the hook. 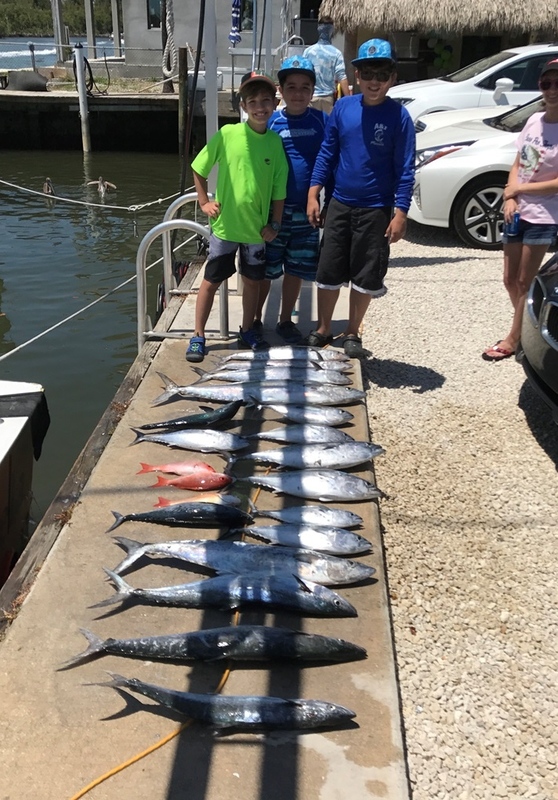 Adam barely had a chance as the bites came and went and the fish box got crowded. And with each fish came claims to victory for all. The boys were young, between 7 and 12 I’d say, so the gear wasn’t easy for them. They did better with it in the rod holder and sometimes needed help from another. The questions never stopped but when someone asks you something with earnest interest, how can you refuse? And their excitement is as boundless as their energy. Where does that energy come from??? As any parent will tell you, kids can be a pain. But the rewards are wonderful and so is fishing with kids. There are times, as in the past week, when we turn to wreck fishing. Just coming off the full moon and some very clear ocean waters with south current, our game and edible fish are scarce. But some of the shallow and deep wrecks provide us with many options. Many of the wrecks we fish are artificial, they were sunk on purpose through the Broward County Artificial Reef program. Ships and other kinds of structures like bridges, docks and even the original molds for fiberglass boats from Chris Craft have been used. They are placed in various depths and provide a habitat for all kinds of marine life. It takes years for these to develop. Both soft and hard corals will grow. This provides food and protection for smaller fish, which attract bigger fish. Amberjacks, Barracuda, sharks, snappers and groupers are just some of the fishes we catch when wreck fishing. This week we have been concentrating on some of our deeper spots. The action has been very good but there has been a problem with a couple of these spots. Getting a bite has not been the problem. Getting the entire fish to the boat is. Just as we use live bait to attract our sport fish, when wreck fishing, a hooked fish is like a live bait, even when that fish is 50+ lbs. Bending the rod, having the fish take line, the angler winding away and all of a sudden the line goes light or slack. If you’re lucky, you get part of what you hooked, usually the head and maybe some of the body. Other times, the hook is completely gone. 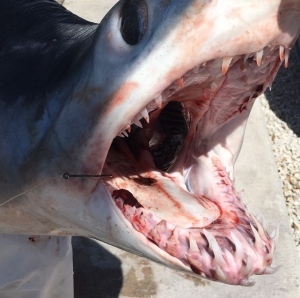 While this can happen fighting any fish in any area, this time of year is especially tough because shark season is upon us. It is mostly Bull Sharks that rob you of your prize. The solution to all this? Reel as fast and hard as you can! LOL And hope for the best. And just maybe, you too will catch your prize like the one in the picture. This week we have had some very exciting deep sea fishing. No two days have been the same except for our near perfect weather off the Fort Lauderdale coast. Tuna, Sailfish, Dolphin and Sharks have been the main targets. One trip stands out as the most exciting and a somewhat disappointment as well, an afternoon trip that started with such a bad luck. But it goes to show that perseverance does pay off. We begin this trip catching some live Bullet Bonitos for bait. We fish for maybe 20 minutes and our first bite comes. Everything goes smoothly as Adam feeds the fish and then he’s jumping. A big Sailfish is on the line! And he’s taking drag! And he’s gone… We call that a swing and a miss. Barely had time to get our angler in the chair. So we reset again and get a bite on the down rigger. We get tight and all is going great! Our young angler is finding out that this isn’t as easy as it looks on TV. And after 15 minutes? The hook pulls and the line goes limp. These were all great fish and would have been great to land but that is fishing sometimes. But wait… There’s more. With our baits out and tons of weed making things tough, we raise a huge shark. He is far too big for the light tackle we have out so we pitch a big bait on a big rod. His first approach was amazing, just to see his speed and agility in chasing the bait. He tries the big bait and then fades. Been that kind of day… Another bait is put out and this time he eats and gets hooked. There are many different kinds of Hammerhead sharks. This one happened to be a Great Grey, the largest of the species. Getting the fish to the boat wasn’t easy. And then measuring and getting this fish back out of the boat wasn’t easy either. He measure out at just over 10’ and we estimated him at about 400 lbs. I’m afraid our picture isn’t the best as the fish took up most of our cockpit and was not enjoying his first boat ride. This is the time of year that we do some Shark fishing off the Fort Lauderdale coast. But a recent catch added to a subsequent catch a few days later created a stir. 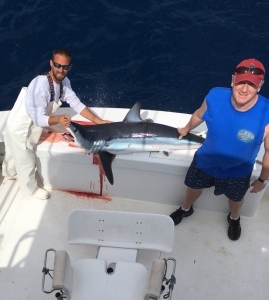 First is our catch, a Mako Shark, a fairly rare catch of the south Florida coast as they prefer cooler waters. Not only was catching one of these a surprise but how we caught it was even more of a shock. You see, we were fishing for Sailfish, among other things, with semi light tackle (30# test) and mono-filament leader. These sharp teeth can easily cut that line and the fight is over. But as you can see in the picture, the hook is placed perfectly and with some luck, the leader and line held for an hour and the fish was landed. Now I mention all this because a few days later I received a call from Cathy in Palm Beach. She had seen the news story and wanted to know if we had released the shark. When I told her no, she was very upset. At one point it got kind of funny as she said she didn’t want to argue but I think she did. I was never able to educate her on what really goes on. Each year my boat releases somewhere around 50 or so sharks live back into the water. If we boat the fish to remove hooks, we put the fish on a water hose to help them breath. Sharks are an important part of our fishery and we like keeping it healthy. This is the first killed shark of my year and the first kill for my sister ship of these creatures. It could be the last as there are only 2 sharks that are considered excellent to eat, the Mako and the small eyed Thresher. And even when they are edible, we don’t necessarily bring them back to the dock. Recreational fishing and hook and line will NEVER have any significant effect on any species in our oceans. According to NOAA’s data, recreational anglers account for 2% of all landed finfish. That is landed fish and doesn’t include the 100’s we release each year. Regulations, permits and other incentives protect our fishery further. So when you see a fish on a dock or brought aboard a boat and the local news is there? It’s because the fish was landed. They don’t show up every day when we release them. And that’s all I have to say about shark fishing off shore of Fort Lauderdale. 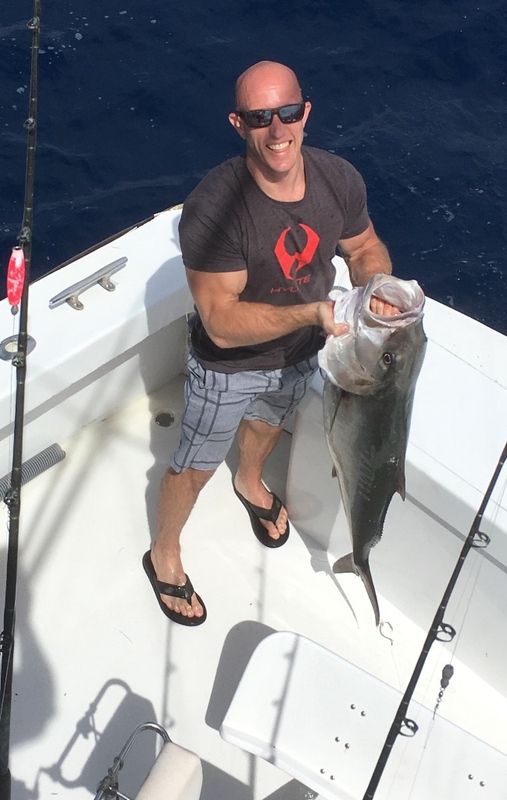 Our latest cold front has made the Fort Lauderdale fishing great! The weather has been picture perfect lately. A cold, or should I say “cool” front came through and while the temps dipped, the fishing took off. 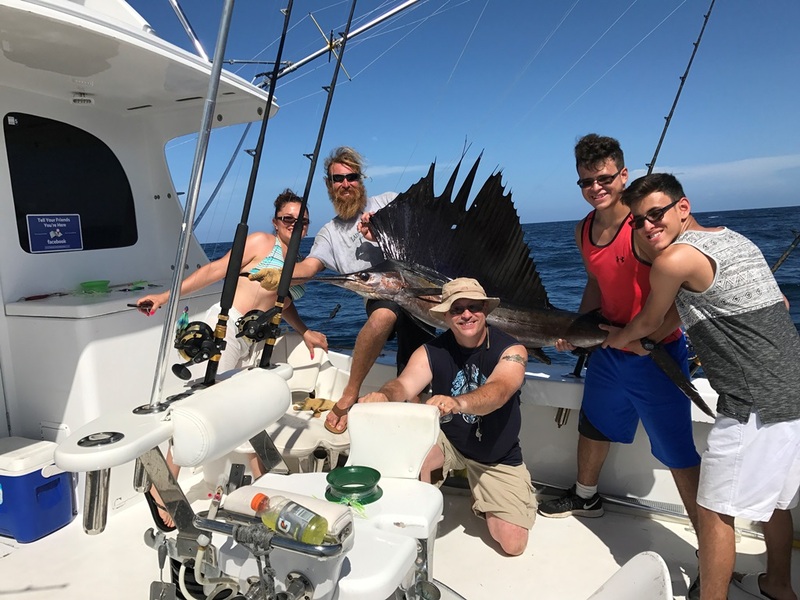 We are having great luck as of late and the last few days are providing a sailfish bonanza! Shark sightings have been frequent with Hammerheads, Sand Bar, Bull and other species. I am surprised if we don’t get the bite when fishing the big baits. Small and good sized Blackfin Tuna are also in our area. 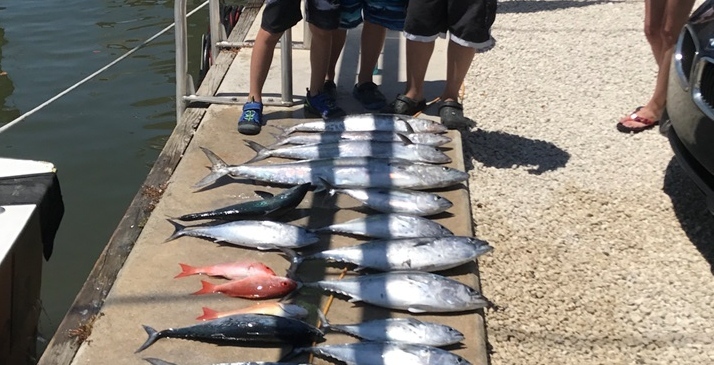 The Kingfish have been extremely sparse but Bonitos have been making up for their absence. Bottom fishing is improving as well. But it’s that north wind that creates the swell and the Sailfish are surfing down the seas. Riding near the surface, Sailfish actually ride the wave aiding them to swim south for the migration. In this form, they look nothing like you see in the picture here today. Their fins are all tucked in, they have pockets that encase the fins, and their color is grey. When the water is that deep ocean blue? They stand out like sore thumbs. This is called “tailing” and you may see just one at a time. But they can also come in bunches and if they get excited when seeing the bait? They “light up”! All their colors come out and they transform from slender grey fish to almost black. Their sails add size and have bright blues with dots that look electric. They become aggressive and even fight over a single bait. Once they bite? It is up to you, our angler, to make it all come together. Jim, Karen, Mike and Jamie from Minnesota had just this day. We caught 2 sails, missed 2 other bites and had another fish on that may or may not have been a Sailfish. The line parted before we ever saw it, disappointing after the 20 minutes we fought it. We usually release Sails, as we did the first they caught but after almost 50 minutes of battle, this fish was exhausted and we couldn’t revive it. It will make a beautiful trophy in their home. With the winds finally slowing down and March being upon us, it’s time for some of the large predators to migrate through our area. 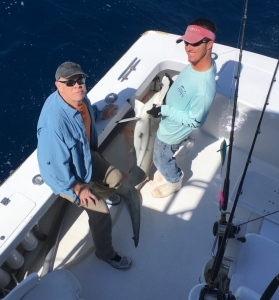 With some of our guests hoping to catch something big, Shark fishing is a great option for the next few months. Many species of sharks will be moving through the area for the next 3 months or so and if you’re looking to test your strength and our biggest tackle? Now is the time to go fishing. As with any kind of fishing, some waiting might be involved. So we like to keep our options open while we wait and one of these ways is some bottom fishing with the “entertainment” rod. Most of the time, we are out in over 300’ of water with the BIG baits out. Dropping a rig to the bottom can be very lucrative. Tilefish, snappers and groupers can all be caught while waiting for something to come along. With both live and dead baits out, anything can bite. But this time of year, expect to see the sharks along with Sailfish, Dolphin and Tuna. I have a picture of a slightly bigger than average Hammerhead we caught a few days ago while shark fishing. I’m sorry but this fish was not very cooperative in having his picture taken. All Hammerheads are protected and after removing the hook, he was released back into the sea, but not before giving Adam a nice slap on the lower leg with his tail. 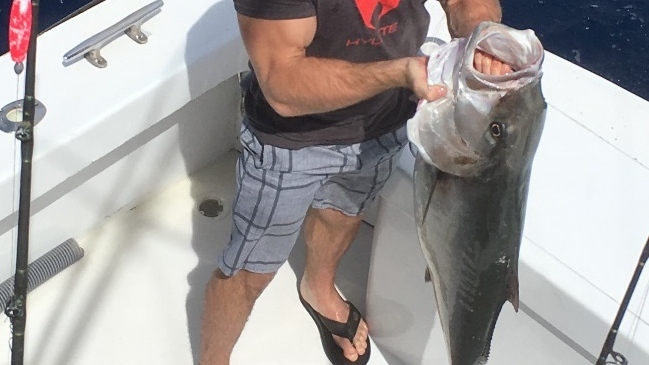 I also have a picture of some Blueline Tilefish we were catching. While usually weighing about 2-3 pounds, these were all nice sized ones with the biggest going around 6 lbs. When you see the mate grab the gaff while bottom fishing? That’s always a good indicator you’ve got some nice ones! So right now, shark fishing is a must if you want something big. Hope to see you soon. Today was just a great day fishing in Fort Lauderdale. The weather was near perfect. Enough wind for the kites but not so much to make the seas rough, plenty of sunshine for our group from Baton Rouge, LA. Todd, with his 3 sons, and a couple of friends from the business. And after a quick stop for beer at a local marina, we were off for our full day fishing. Now it goes without saying that catching fish is certainly a big part of what makes a great day fishing. Attitude is another part of a great day fishing and this group had plenty of that! Listening to the boys trade shots and barbs was hilarious, their uncle egging them on. So a trolling we will go and though the water looked great, things weren’t happening. We managed a nice Blackfin Tuna and missed a couple small hits. With a nice color change and rip current in 400’ of water, we decided to switch gears and deploy some live bait in the kites. A few big baits for whatever might be around and some deep dropping for Tilefish while we waited. The deep drop rod is called the entertainment rod. It keeps our anglers busy while we wait for a big bite on the kites or big baits. The Tilefish didn’t disappoint us, most were good size but that went on hold when a large Mahi-mahi showed up for a Goggle eye. The fish was over 30 lbs. and became airborne as soon as it struck. One of the boys on the rod fighting him with excellent finesse as a follower came into view. Captain Adam managed to get another kite bait in front of the male and we soon had both fish jumping. 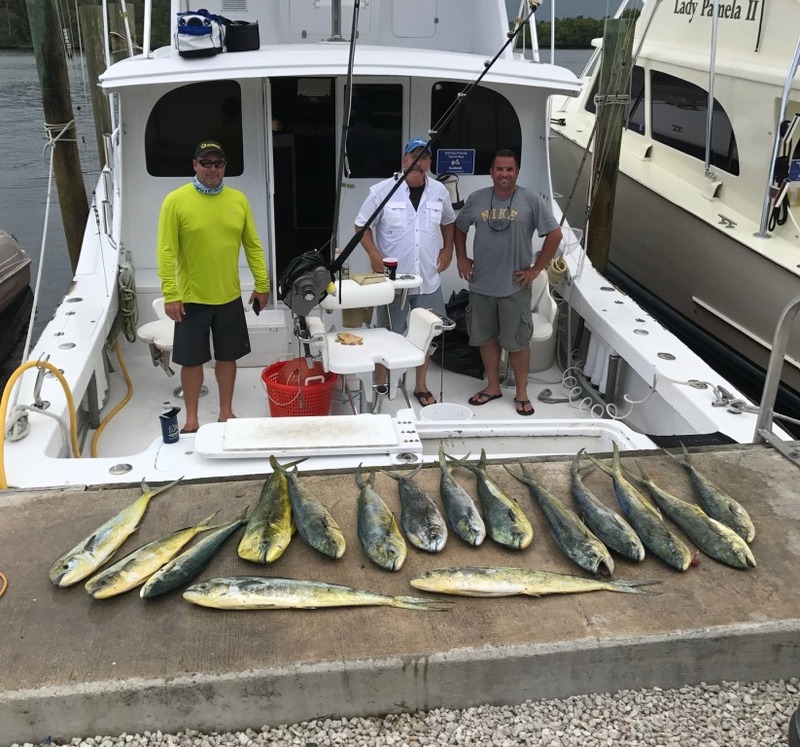 Big Mahi’s are always a handful when they get near the boat and the smaller male proved to be more difficult and stubborn. After 40 minutes, both were landed, and while high fives were going on, the jug went down and we had a sea monster on! For a third grader, the youngest son took the first shot at whatever had eaten the bottom bait. 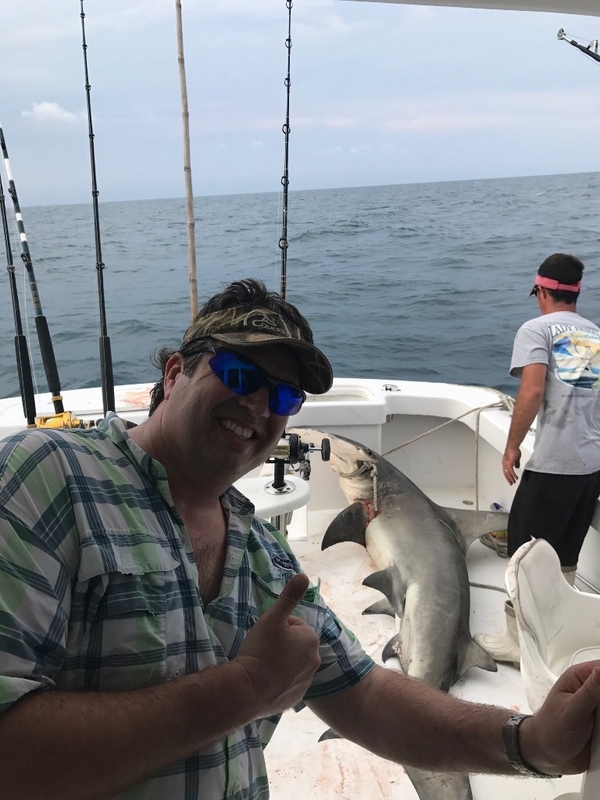 It turned out that he stayed put throughout the fight, the entire 70 minutes to land a 110” shark! Tenacity is all I can say about that. To see the video of the shark, check out Fanntastic Fishing Facebook page.